There is a DCT for each data type and should be present inside the directory of the data type. A DCT is an XML configuration file named datacapture.cfg. This DCT contains the definition of data type itself i.e. the information the data type will contain. For example the sports_news data type can consist of a Paragraph containing text(News item) and an associated image(News image). 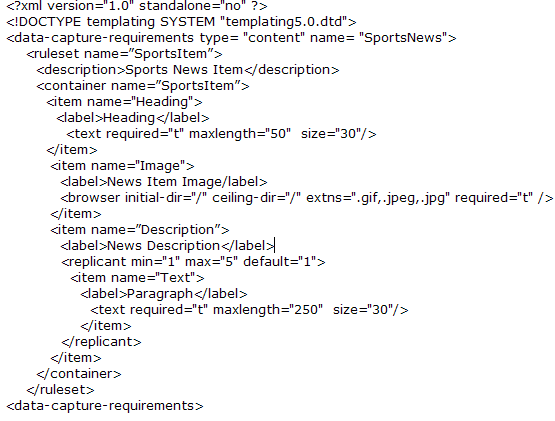 The DCT contains the tags corresponding to these data for data type sports_news. When a Data Content record is to be generated, the Data Capture Subsystem of TeamSite Templating interprets the tags in DCT and presents a form to the content contributor which can be filled up to capture data. The DTD has all the data elements which can used top create the DCT. —data-capture-requirements ,tag encloses the entire DCT. Attribute ‘type’ is mandatory here. This can have values as ‘content’, ‘metadata’ or ‘workflow’. For Templating datacapture files we use ‘content’.This tag is MANDATORY. —ruleset, tag encloses all the items in the DCT. 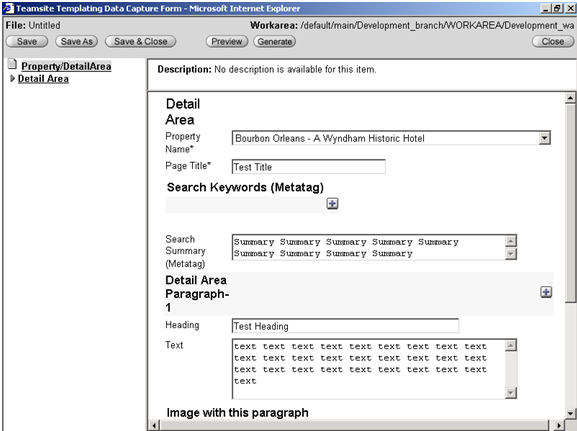 The value of attribute ‘name’ forms the caption of data capture form displayed. This tag is MANDATORY. —description, tag is OPTIONAL. 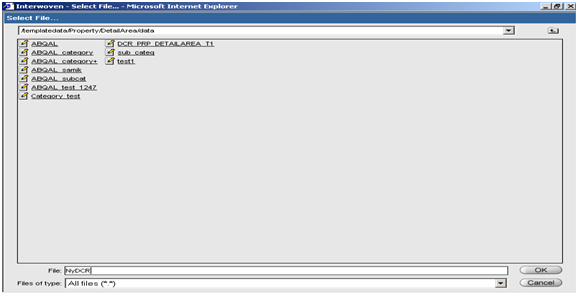 It holds the description about the DCT which gets displayed at the top of the data capture form. —container, tag represents a set of subelements. —The <item> element is used to assign a user defined name to an element type. —The information contained in <label> is displayed as the field name in data capture form. 1. min – Used to specify the mininmum number of instances of the replicant list. 2. Max – Used to specify the maximum number of instances of the replicant list. 3. Default – Used to specify the default number of instances of the replicant list. 4. Hide-name – This will determine whether the label gets displayed for the sub-items. 4. <select> – This will contain a list of <option> tags nested inside it. 5. <hidden>This contains a value invisible to the user. 6. <readonly> – This will display the item as readonly. 7. 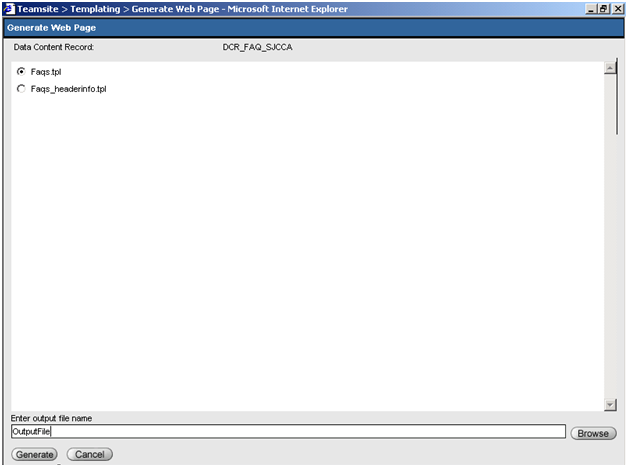 <allowed> – This is used to enable or disable an item depending on the user’s role. This above set of tags will present <text> only to the user with role as Administrator. Creation of DCRs in my Next Post. Autonomy Interwoven Teamsite is a Content Management Solution. 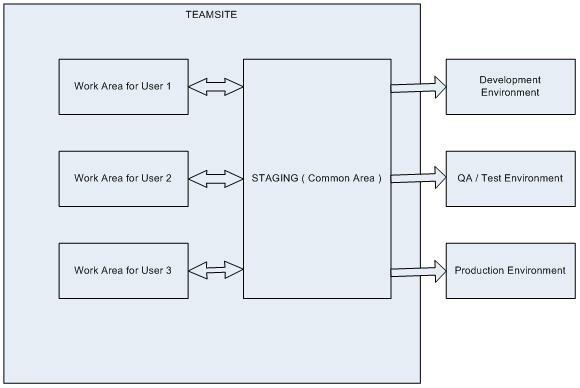 Team Site is a tool used for Web Content Management.This tool employs a hybrid architecture which offers file and database versioning, a user friendly workflow engine, support for windows and a high availability. o Enable the user to enter, edit and store data or input. o Specify the look and feel of the data to be shown. 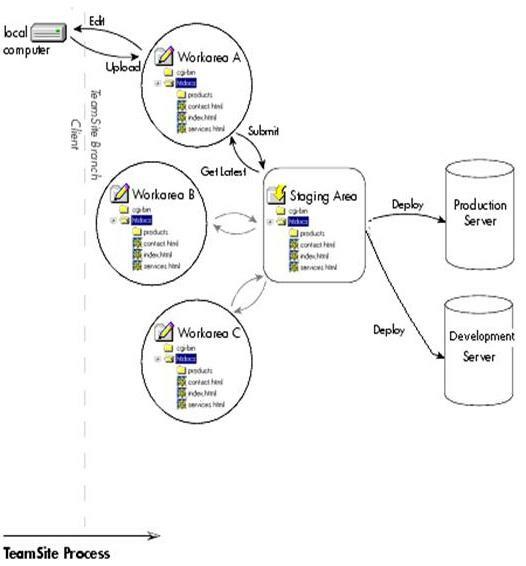 o Incorporate other interwoven features/products like TeamSite Workflow and DataDeploy, etc with the data entered. • The ability for using file content without much expense of time and effort. • Proper management of the content. 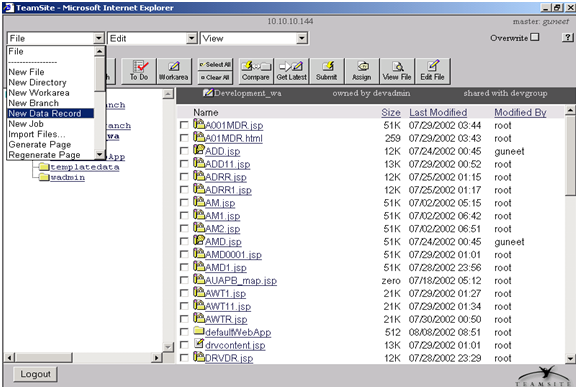 • Automatic storage of content to a database whenever it is created or updated. • Improving management of project and guarantee reliability of the data. • It has a better advanced user interface. • Fast identification of the task assigned to individuals and manages them. • Results in a shorter project development cycle. • Offers more command over the production process. • Reinforcement for Microsoft FrontPage 2000 Server annexes. • Gives a better admittance to FrontPage Webs and Visual InterDev projects from inside the tool itself. • Allows both single-byte and multi-byte content to be entered and shown. • Provides metadata management in topical dialect enabling the matter to be comfortably searched and utilized across multiple enterprises. • Allows management of the entire material/content lifecycle in local dialect. • Higher security for the business information. • Safeguard the content present in TeamSite by regularly saving the in-cache content to the disk enabling fast data retrieval. • Dual CPU server should be used if data record searches are to be employed. • For the Java based interface, an extra 60MB space is needed. • The java templating on the client machine needs 20MB space. • For Solaris, it can be run on Sparc/ UltraSparc platforms. For more information Visit Autonomy Interwoven!